An Afghanistan war veteran and a farmer, Kendrick was an advocate for the hungry and for sustainable agriculture. Through the organization she founded in 2011, Kendrick partnered with businesses, churches, and other organizations to bring fresh produce to Iowans in need. Kendrick received broad recognition for her efforts, both in her hometown of Cedar Rapids, Iowa, and at a national level. In 2014, the White House named her a “Women Veteran Leader Champion of Change” and she was featured in the documentary “Terra Firma” about female veterans in farming. 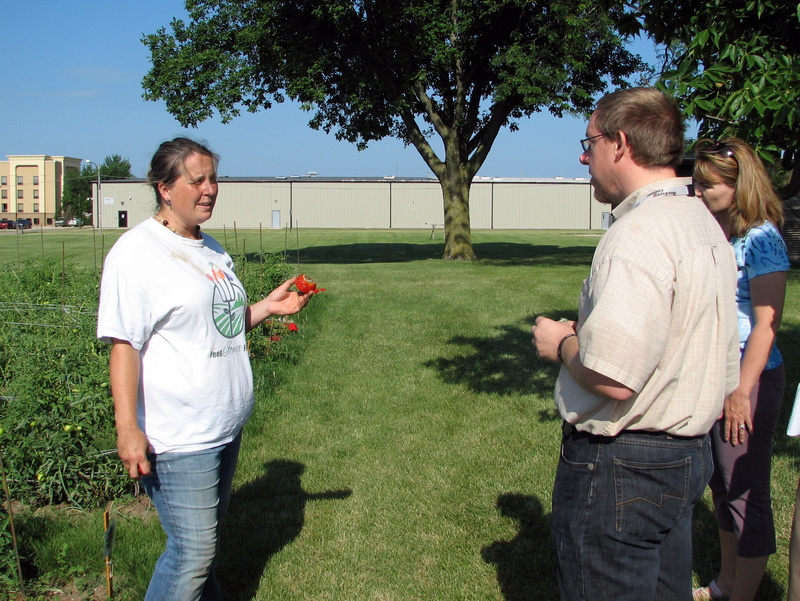 I first met Kendrick in July 2013 when I wrote a story for the Cedar Rapids Gazette about Feed Iowa First’s partnership with Cedar Rapids-based Rockwell Collins to turn an empty lot on the company’s campus into a tomato garden. Produce from the garden went to Horizons Meals on Wheels, another local non-profit organization, which used it to create ready-to-eat meals for seniors and the disabled. Since our first meeting, I had several other occasions to interact with Kendrick; she became one of my go-to resources on agricultural topics. She was smart, hard-working, and always willing to answer whatever questions I had for her. Sonia Kendrick died on March 20, 2018, at the age of 40. She leaves a huge hole in both the organization she founded and in the larger Eastern Iowa community. In her memory and in an effort to carry forward her important message about food insecurity, I am republishing another piece I wrote about Kendrick and Feed Iowa First. This piece first appeared on the now-defunct site Examiner.com in July 2013, around the same time as the Gazette story. 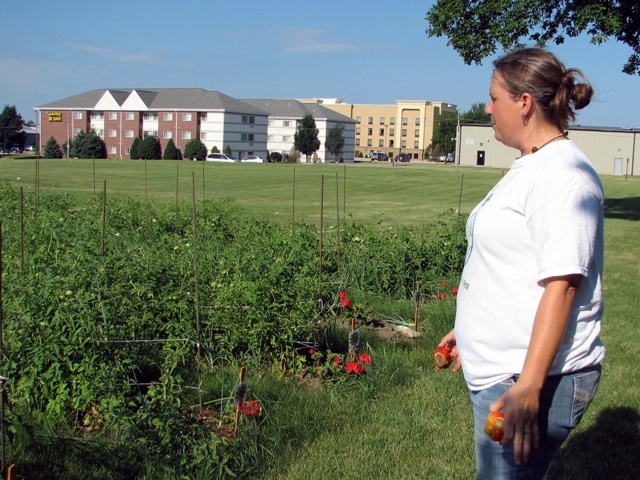 Sonia Kendrick surveys the Rockwell Collins tomato garden in July 2013. “Be the change that you wish to see in the world,” Mahatma Gandhi once said. One Iowa woman is trying to do just that. As Sonia Kendrick worked towards her agronomy degree at Iowa State University, she became aware of a disturbing paradox in her home state. Although Iowa is best known for being an agricultural superpower that feeds the world, an increasing number of Iowans – one in eight adults and one in five children – go to bed hungry each night. An even greater number are what the U.S. Department of Agriculture calls “food insecure,” meaning they have limited or uncertain access to adequate food. “There are 25,000 people in Linn County and 400,000 in Iowa who don’t know with certainty where their next meal is coming from,” Kendrick said. To make matters worse, although Iowa tops the nation in the production of corn, soybeans, pork and eggs and is in the top 10 in the production of nearly every other agricultural commodity, it imports more than 85 percent of its food, and most of it travels on average 1,500 miles to get to Iowans’ plates. Taking Gandhi’s words to heart, Kendrick decided to do what she could to solve Iowa’s hunger problem. In 2011, the Afghanistan war veteran founded Feed Iowa First during her summer break from college. The nonprofit organization’s mission is twofold: to grow fresh produce for Iowa’s food banks and to assist landless vegetable farmers in qualifying for beginning farmer loans. In order to accomplish Feed Iowa First’s objectives, Kendrick plans to create 500 acres of urban farms in Linn County by partnering with churches and corporations that have available green space. She said such land is in plentiful supply. According to an Iowa State survey, there are 800 acres of urban green space on property owned by Cedar Rapids-area churches alone. Kendrick said that conventional ideas about land use must change given current projections for a 70 percent increase in world food production by 2050 in order to feed nine billion people. In 2011, Feed Iowa First started with one acre of donated land and produced over one ton of vegetables for a local food bank. By 2013, the organization had increased its production to five or six acres of urban gardens. Current production plots include 8 raised beds of 2,000 asparagus plants on a vacant lot owned by Horizons, A Family Service Alliance, and 30 100-foot rows of tomatoes and onions on land at Rockwell Collins’ C Avenue complex in Cedar Rapids. The harvests will be donated to Horizons Meals on Wheels, which provides ready-made meals to seniors and disabled persons. GE Capital and several area churches also have donated land on which Feed Iowa First volunteers are growing cherry tomatoes, onions, collard greens and watermelon for area food banks. Kendrick said another challenge to combating hunger in the state will be a lack of farmers to grow all the produce that will be needed. Yet, she said, there are many obstacles faced by would-be vegetable farmers. Lending institutions generally will not loan money to new farmers, and to qualify for a low-interest loan through the Farm Service Agency (FSA), a prospective borrower must be able to show three years of farm management experience. Because current vegetable producers typically cannot afford to hire farm managers at a living wage, it is nearly impossible for beginning farmers without land to meet FSA lending requirements. Through Feed Iowa First, Kendrick hopes to help aspiring farmers gain the needed experience to qualify for FSA loans by hiring them to manage the organization’s network of urban farms and by paying them a living wage through grants. This entry was posted in Growing Food and tagged farmer, Feed Iowa First, growing food, Sonia Kendrick by Deborah Neyens. Bookmark the permalink.